Summer is settling in and I am finally done with switching the blog to this Squarespace platform. There's still a lot to do in regards to old posts and some design work so bear with me, but I'm so excited to continue my Europe blogging - starting with finally ending my Vienna posts with my recap vlog. The Wiener Prater is the last place I wanted to talk about, which is a public park in Leopoldstat full of rides that feel like they should belong to a bygone era. There's a touch of seediness to many of the ageing roller coasters and 'funhouses'; when they're lit up and bustling with the tinny fairground sounds and fair lights, it's where teenagers from old movies would go on dates and win giant teddy bears for each other. When you inch closer to the edges of the park and start to see the slightly faded paint and chips off the carousel or signs, it starts to feel a little horror-movie-set-like. It's not a cheap place - most of the larger rides are 5 Euros each, so we basically budgeted for about four rides. I have to say that screaming on a roller coaster with my brother was not something I had expected to do in Vienna, but my inner adrenaline junkie - so starved in Sydney given our sorry lack of 'adult' roller coasters - definitely enjoyed them. 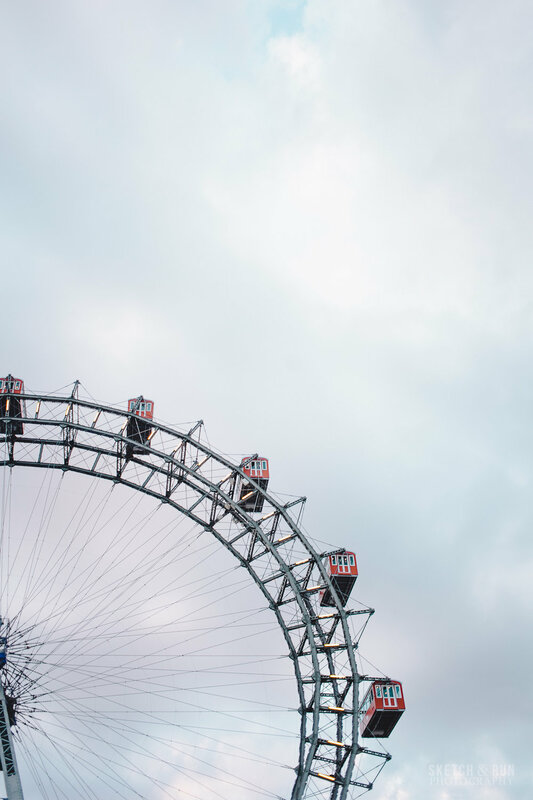 Our formal Vienna tour took us on the iconic Wiener Reisenrad ferris wheel right at sunset, which gave us a gorgeous view of the entire city. It is definitely a tourist trap but the view over the city at sunset makes it pretty worth it.